I had those beautiful zucchini, not too large, not too dark, they are available only on summer and have this wonderful flower attached to them! 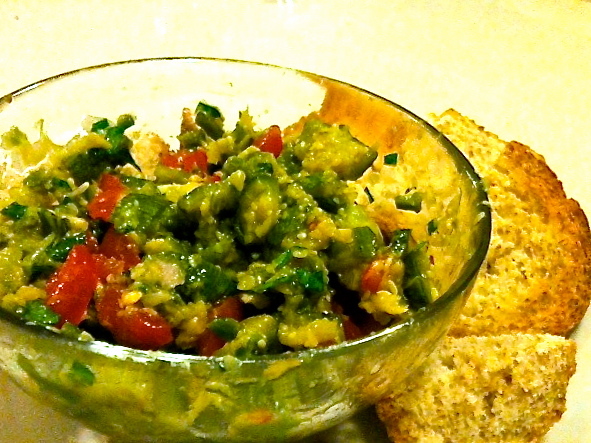 I’ve prepared the classic guacamole recipe, but with zucchini instead of avocados. It was experimental, but it turned out deliciously! My husband appreciated it even more the day after, when I’ve spread some on his sandwich! Cut the zucchini into little chunks and cook them as you prefer, I’ve cooked over a no stick pan by adding some water (few at the time) but I think other ways will work the same. Using a fork mash the zucchini and add cilantro, chili, lime, salt. When it’s ready add the chopped tomatoes. I served with whole grain bread, toasted.